However, after dismissing the reigning champions for 206 to lead by 174 runs on first innings, Notts decided against enforcing the follow-on. By the close at Chelmsford, their advantage had been extended to 209 in 12 overs in the evening sun, though they lost captain Chris Nash to a catch behind from a tentative prod to Matt Quinn. Matt Carter, the 22-year-old off-break bowler, spun the web that led to Essex’s downfall inside two sessions with four wickets for 34 from 15.3 overs, of which eight were maidens. He kept his nerve when he briefly came under heavy artillery from Ravi Bopara, who stood head and shoulders above the carnage before becoming Carter’s second victim. 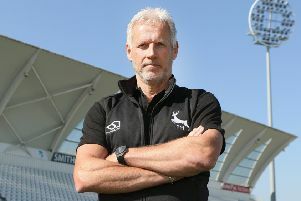 Notts bowling coach Andy Pick said: “The bowlers have done really well, worked really hard. We made a good strong start through Fletcher and Milnes and that set the tone. Then we chipped away and had a better day than we hoped for. “Milnes has bowled really well. He made his debut last week at Taunton and we thought he was a little bit tentative, which you’re bound to be on your first-class debut. “He’s got a reputation for being a bit of a prickly character, especially in the Premier League back home, and we said you just need to express yourself and change the way you go about your job. He attacked and he was all over Cooky for a while. “He’s also a better batter than we’ve seen so far [Milnes made 22 in the first innings and 3* as nightwatchman]. “He doesn’t have a lot of opportunity in the second team. Matt Carter, too, scored some useful runs this morning and set the basis for the game, and then we did what we did with the ball. “Again, tonight as nightwatchman, Milnes has shown he’s got a few clues with the bat as well. We’re hoping he’ll go on and score more tomorrow. Of the decision not to enforce the follow-on, Pick added: “I don’t think there was too much of a discussion at all, to be fair. I think we had decided early on, without getting ahead of ourselves, that if we got the opportunity we would bat again and bowl last.